A subtle, apple-like flavor of chamomile quickly gives way to the robust, full-bodied flavor of raspberry leaf ending with the clean, refreshing flavor of peppermint. 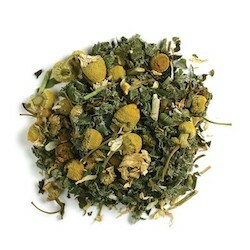 Ingredients: organic chamomile flowers, red raspberry leaf, peppermint leaf. Directions: To enjoy, pour 6 oz. boiling water over 2 teaspoon of tea. Steep 3-5 minutes, strain and serve immediately.